Empowerment. A term often used in the context of development. But how does empowerment help people that do not have enough money to feed their family? SERVE’s work is a prime example how empowerment can have a lasting impact on the lives of entire communities. Finding suitable partner organisations has been one of the biggest challenges we faced in the planning process of our trip. Communication was often limited and judging how suitable an organisation is for a successful cooperation was difficult. For this reason, we had to base our decision on the impressions we got from the website and Skype calls. From the information on the website we had doubts whether SERVE would be a suitable partner but we decided to give it a try. Sri Lanka is a very popular tourist destination and with the only international airport located just north of Colombo, any foreign tourist passes through Colombo. At first sight the city is clean and well developed. But within the first few minutes of the beautiful train ride along the west coast, the view of the crushing waves is interrupted by wooden shacks where families have illegally settled on the shore. But the poverty is often overlooked by commuters and tourists in the crowded trains. SERVE’s office is located in a southern suburb of Colombo in-between the railway tracks and the sea. With a variety of projects SERVE gives support to the people that have been left behind in the “development success story” (World Bank). The largest project with funding by the Kindernothilfe is focussed on community development. 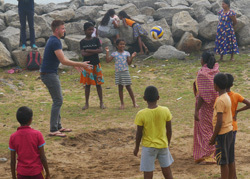 Following the Self-Help Group approach SERVE reaches out to several poor communities around Colombo. An important part of the concept is the empowerment of children to bringing lasting change to the communities. In Community Centres children get to spend time after school in a safe and friendly environment. SERVE’s social workers visit the different Community Centres on a regular basis and conduct activities for the children. Dance, Music and Computer teachers give the children the opportunity to develop new skills. In child forums children learn about their rights and in a participatory environment they learn to claim these rights. The children learn about the importance of education and how to use their skills to escape poverty. Problems affecting the communities are discussed and solved at the SHG or Cluster level. The Federations, representing almost 1.000 women, can take political influence to solve problems affecting several communities. An essential part of helping communities to develop is providing economic opportunities. Finding capital to start a small income generating business is a major challenge in countries with double digit interest rates. To build capital the members of the SHGs decide on how much money every member brings to the weekly meetings. Even with a small amount, 15 women can build up a capital stock to give out loans to the members. Every member has the right to borrow money from the group to buy stock for their small stall or to pay bills at the end of the month. This new financial flexibility gives the women the opportunity to reduce the risks in taking up their own business. The uniqueness about the SHG approach is that the development focus lies on women. In addition to the men, women are encouraged to generate additional family income. 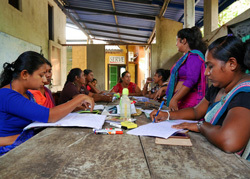 The women gain the confidence to start their own little business and know that they have their group to support them financially and give advice. Not only do the women get a voice within their community. On the Cluster and Federation level, the common problems among communities can be solved by bundling the power of hundreds of women. Building such a complex structure is a major and time-consuming process. SERVE has taken on this challenge with the support of their reliable partner Kindernothilfe. But running long-term projects is not easy for small organisations. Locating funds can be a major challenge, as results are often not visible for years. Most of the funding is bound to a certain area and cannot be used as desired by SERVE. Therefor locating additional funding for expenses that are only indirectly connected to the project can be difficult. We are confident that the volunteer program we have initiated can be an important income stream for the important work SERVE does in the local communities. After the board has passed all our the changes, the new website will go live. Follow our Social Media Channels where we will be keeping you up to date!